Yesterday, Motorola announced the Moto G, a high-quality smartphone priced at just $179-$199. This announcement marks the first true shift in Motorola's traditional hardware-based strategy since the Google acquisition. This move invalidates suggestions about Google targeting hardware profits. Google's revenue model has always been focused on online services/advertising and this is unlikely to change in the near future. So instead of using Motorola as a hardware company, Google is beginning to use it as a distribution channel, i.e. instead of looking at Motorola as a profit center, Google is looking at it as a cost center to streamline the distribution of services. This is reminiscent of Xiaomi's strategy and in complete contrast to Microsoft's hardware-based strategy with Nokia. 1. Encourage OEMs to provide a quality experience at lower price points - Today, this is especially problematic with devices priced at ~$100. While hardware quality has rapidly improved, Google hopes to accelerate this trend by increasing the availability of high quality, low-priced devices. With the Moto G (and Android 4.4 KitKat), Google's primary aim is to increase the usage of its services among low-end to mid-range users. The targeted regions for the Moto G launch seem to support this fact. The initial launch is focused on Latin American and European countries where prices are either unsubsidized or subsidized but not insulated. This will be followed by a launch in other Asian markets and the US prepaid market (and possibly T-Mobile). 2. Increase penetration of stock Android devices - Leading OEMs (like Samsung) use skins and services duplicating those from Google to differentiate their devices in the market. These OEMs also sell devices priced at ~$200, which are fairly popular in emerging and prepaid markets. These products already face strong competition from smaller vendors with stock Android devices. Therefore, Google's goal is, again, to accelerate this trend by providing a similarly priced, stock Android device from a relatively well-recognized brand. Google hopes that the presence of Motorola and continued upmarket competition will eventually help stock Android/Google devices overtake skinned devices and increase engagement with Google services. 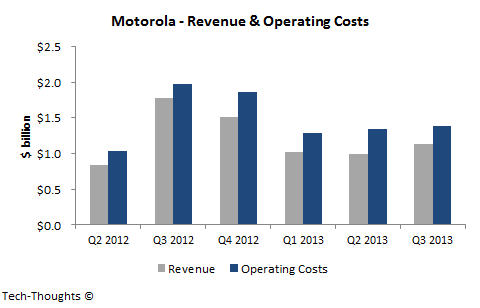 To strengthen this strategy, I expect Motorola to continue launching cheaper devices over the next few years. Motorola CEO, Dennis Woodside, hinted as much with this quote - "There are a lot of letters that come before G in the alphabet".